Kubuntu Linux 18.04.1 DVD (32-Bit) | Linux DVD Shop - UK Linux Shop supplying Linux on CD, DVD and USB with Free UK Delivery, 24Hr Dispatch. Kubuntu Linux 18.04.1 is the latest release of the Linux-based Ubuntu operating system. Kubuntu Linux allows a full install of one of the best and easiest Linux distributions. Kubuntu is a Linux KDE version of one of the most popular Linux distros around, Ubuntu. 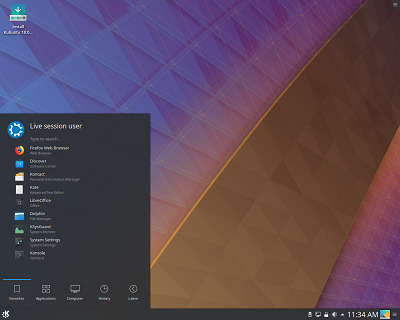 Based on the latest KDE Plasma 5.12 desktop, it contains the 4.15 Linux Kernel and all the power and features of Debian. Ubuntu is topping the charts as peoples favourite distro and this super KDE version will no doubt be going for that position too in the near future.